* It is FREE for you and your entire family, as long as you sign up and fill out the Sky Zone waiver by August 5th. * There are two sessions: 3:30 pm and 6:00 pm. 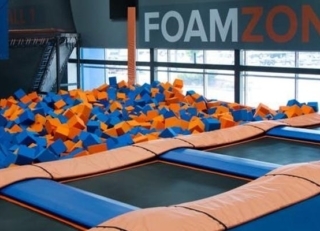 * Have a blast with Foam Zone, Sky Hoops, the Warrior Course, Wipe Out, and more! * Joy FM will provide your entire family with “You are loved” bracelets. * The Boost 101.9 DJ booth will be there with surprise entertainment and prizes! * Small snacks will be provided. Here’s the best part: when you sign up for the Joyful Celebration, Joy FM listeners will have the opportunity to receive a prayer bracelet with the first name and age of the children in your home - this will happen in November, National Adoption Awareness month. How exciting to know that so many people will provide our children with individual blessings!